What inspired you to start Love Playing Dressup? I started Love Playing Dressup to share my story with people, listen to theirs and connect. I have this innate love to connect with people. I had struggled with weight and body image issues through college and used [dressing up] as a means of overcoming low self-confidence. Oh gosh, so many things! Images on Pinterest, fabulously curated pictures on Instagram, magazines, book covers, characters in my books, movies, everything! But I think my Indian roots are where most of my inspiration stems from — I am gravitated to color and prints. Is it too predictable if I say… my mom? But it is true — my love for color comes from growing up seeing her in pretty saris. I also adore Victoria Beckham’s style and I feast on every Elie Saab creation. Which current trend are you loving most? The off-the-shoulder trend — feminine and flirty. Jumpsuits! I don’t know why but I can never jump on that bandwagon. We're huge fans of athleisure, obviously. What is your favorite athleisure piece? Isn’t it the best? I literally live in my tights so I am happy that they are now socially acceptable. 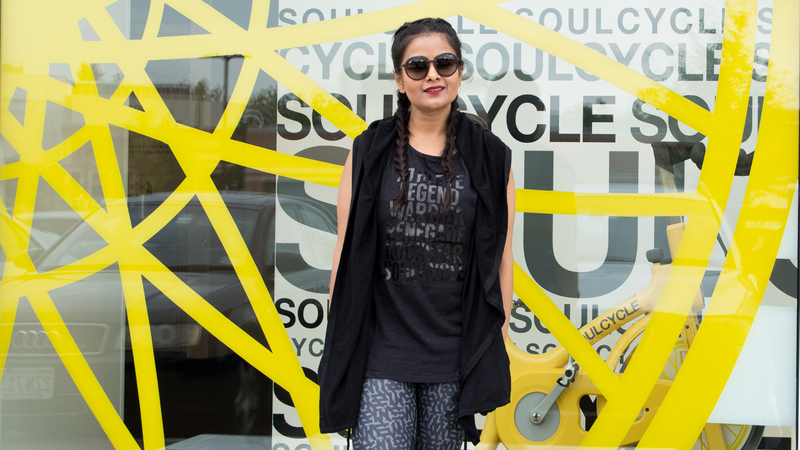 I love the SOUL & BRUNCH top from SoulCycle. Throw on a denim jacket, keep those cute kicks and you are ready from the studio to street! 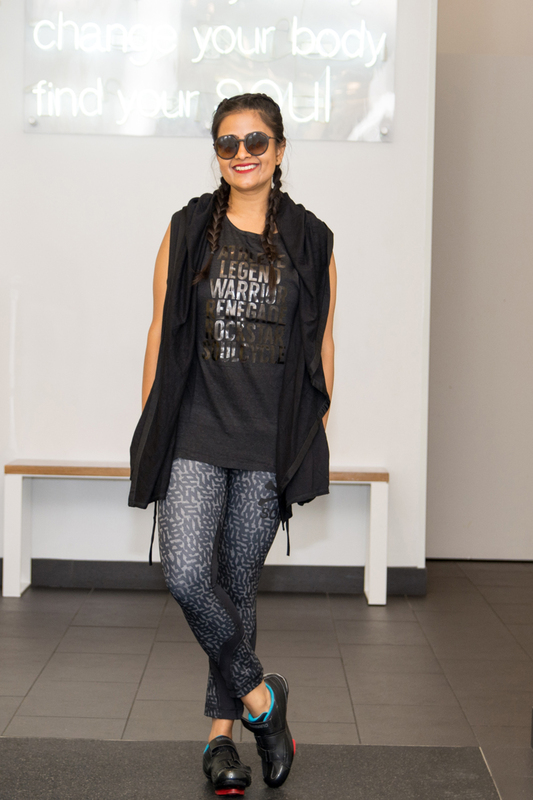 What’s your best tip for incorporating athleisure beyond your workout look? Everyone always thinks of the clothes when thinking athleisure. But don’t forget your hair. A messy bun or put a cute scarf to mask the sweaty hair. More importantly, know where to draw the line. If you are attending an important meeting or giving a presentation, joggers are not appropriate. What tips can you give for taking care of your clothing? Always read the label... before you know it you have thrown your favorite cashmere sweater in the washer. Does that sound like a lesson learned the hard way? Take us through your closet. Do you organize by color, season or activity? • I have a good sized closet but keeping it organized is always a struggle. I do keep my shoes very well organized though. My husband has built me a nice shoe closet and I am able to color code them (although I am constantly asking him to make me a bigger one). I store off-season shoes in separate boxes. • I go through my closet thrice a year and purge a lot of stuff – that could be consigning, donating or discarding. What sets Boston style apart from the style of other cities? I love that most people here are nonchalant about trends but chic nonetheless. No one can rock a beanie, puffer jackets or blanket scarves like Bostonians do. I am an avid online shopper — my husband has become an expert in folding boxes! I love shopping at Nordstrom, ASOS and J.Crew. My gym membership where I took Zumba and other classes had just ended and I was looking to try something new. 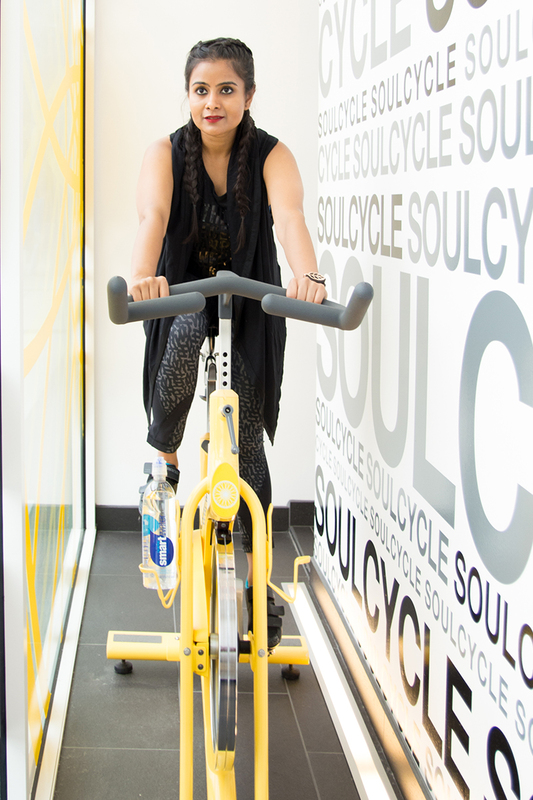 All the hype about SoulCycle made me want to try it out. I actually got my husband and a friend to take the class with me. During the class I kept on looking at them with a smirk on my face because I could see they were enjoying it so much (as was I) and I could take credit for introducing them to something so fabulous and fun! Let’s talk about hair/makeup: What are your top pre and post-workout tips? No makeup and dry shampoo! I recently read an article that said 70 percent of women think dry shampoo is one of the best creations of the century! I use Kerastase Powder Bluff more than I’d like to admit. How do you fuel up? Any favorite pre or post-workout snack? I always have a fruit before a class, even if it’s the 5:30 AM one. Lately I am very much into almond-milk smoothies – so I always make one, for after class. I add things like chia seeds, bananas, kale, sunflower seeds to make it extra nutritious and filling. This way, even if I am headed to brunch straight after a class, I am not starving until food arrives and not gorging down pancakes directly after a good workout. The Prodigal Daughter – I read it first when I was 10 and I still read excerpts from time to time when I am looking for inspiration. One of my favorite lines from the book is, "when you finish the exam, you shouldn’t feel that you could have done better!" You can read more about Neha in her blog, Love Playing Dressup and follow her on Instagram, Facebook and Twitter. Questions or comments? 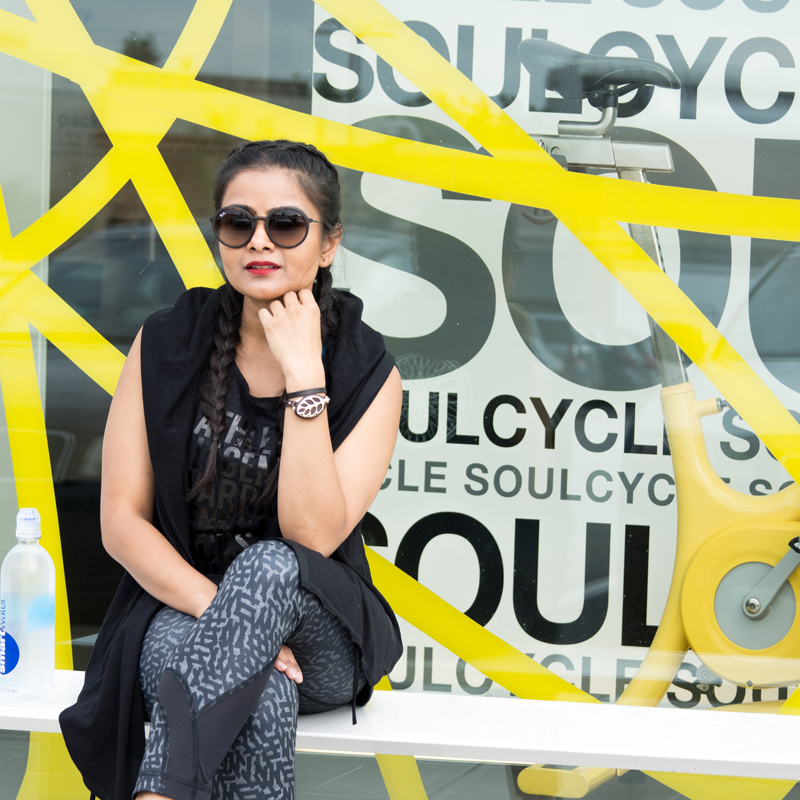 Email soullife@soul-cycle.com, Want to ride? Click HERE to grab a series and book a bike!